Nestled amongst established gardens and pine trees, stand the impressive Pine Cliffs Deluxe villas. This collection of four luxurious villas boasts large expanses of indoor and outdoor living space which are complemented by the luxuries of a discreet hotel service. Stunning features such as brick domed ceilings and bespoke furnishings flow throughout with all bedrooms benefiting from en-suite bathrooms. Outside, open and covered terraces for dining and relaxation overlook the private pool and gardens. All of the villas have similar furnishings, fixtures and fittings. Breakfast and half board are free for children under 3 years old, when the same meal plan is booked by parents. Cots are provided upon request, bedding/bumpers etc are not supplied. All prices are PER NIGHT for the villa only. Villas are booked from 4:00pm on your arrival day to 10:00am on your departure day. Please note that availability shown is subject to confirmation - please call our reservations team. If you want to get away from the overcrowded hustle and bustle of Albufeira and something more of the real Algarve than Vilamoura, but don't want to be far from either, then a holiday in Olhos d'Agua may well fit the bill. It is a popular fishing village located in-between the two. Most of the activity in Olhos d'Agua is on the main street, with this road running down to the hill to the beach, and the promenade, which is fringed by palms and a very pleasant stroll. Here you'll find a fair selection of bars and restaurants. While it can get quite busy in the summer months, compared with Albufeira, it is quiet resort, and out of season, very quiet indeed. However in season, parking can be a bit of a nightmare. Apart from the beach, bars and restaurants there is not a huge amount to do, it is best suited to families who want a relaxing beach holiday or as a base for exploring other areas in the Algarve. It is also a popular destination for Portuguese families, which is always a good sign. 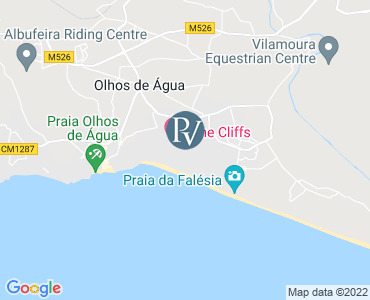 There are no nightclubs here, so if that's what you are looking for then you'll have to pay a visit to the "Strip" at Albufeira or Vilamoura. It is 6km to Albufeira, but only about 3km to the "Strip", where you'll find the liveliest of the nightlife. Walking will take you about 40 minutes, although there is a regular bus service, which is cheap. Alternatively a taxi will only cost a few Euros.